Phil Creek BA (Hons), ATD, SWAc was born in Cambridgeshire, England, in 1951. He received his Honours Degree in Fine Art Painting from Manchester University in 1973 before undertaken Post-graduate study in the History of Art and Design at Birmingham University. After a career in art education, including being Director of The Beaford Arts Centre, lecturing on The Masters in Education Programme at Exeter University and being Chair of SWGaTE he left his last full-time post, as County Adviser for Art and Design in the county of Devon, in April 2011. He now concentrates on his painting full-time working on the coast or in the landscape and townscapes of Devon, Cornwall and Dorset. Initial studies are then further developed in his East Devon Studio. 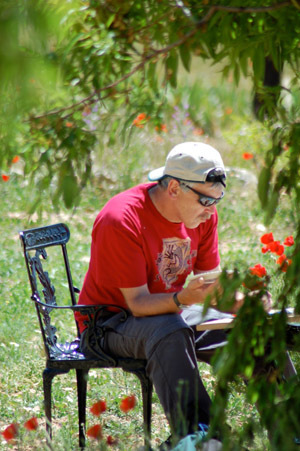 Phil painting in the landscape. 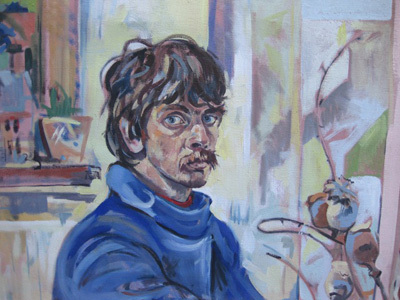 Phil has paintings in private collections in Spain, the USA and the UK and has exhibited in The Mall Gallery, London, The Royal Albert Memorial Museum and Art Gallery, Exeter Phoenix and The Gloss Gallery, Exeter. He is a founder member of DAISI, honorary member and, from April 2015, Chair of The South West Academy of Fine and Applied Arts. His work is inspired by the landscapes and seascapes of both the county of Devon, England and Cape Cod, USA where he visits several times each year to work in and around Eastham, Wellfleet and Truro. His sketchbook work is predominantly small scale and undertaken in gouache directly responding to place and time in the outdoors. 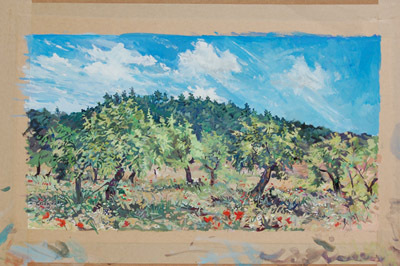 These initial plein air studies are developed into studio pieces either on the Cape or back home in East Devon, England, using gouache or acrylics. He is particularly interested in portraying how people inhabit and relate to the natural landscape and built environment. 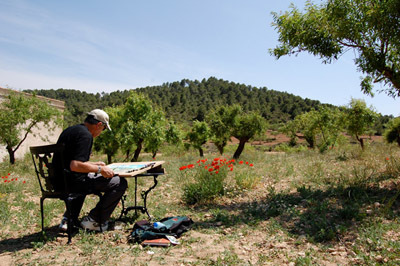 Phil painting in the Spanish landscape. The almost finished Spanish painting - 'Almond Trees'.